It was another close game - but this time Sussex were on the wrong end of a tight contest as they lost by 58 runs at Canterbury. New Zealand’s Matt Henry was awarded ‘Man of Kent’ status by appreciative home fans after starring with bat and ball during his side’s second-division win over Sussex in Canterbury. The 26-year-old from Christchurch top-scored with a belligerent 55 in Kent’s second innings and then picked up the ball to claim six for 53 and 10 in the match to help dismiss neighbours Sussex for 211 and clinch a third successive victory with a day to spare. Sussex head coach Jason Gillespie said his side would dust themselves off and move on: “We spoke earlier in the day about when lower order players come in and start playing big shots because we had a similar situation in our last game. On that occasion we changed our game and our plans and we paid for that. Gillespie added: “The 74-run partnership [between Henry and Harry Podmore] was vital when we’ve finally gone down by 58 runs overall. Yes, it’s easy to point to Henry’s knock as the reason, but if you look at the game overall we had opportunities where we could have been more effective with both bat and ball. Needing 270 for victory after finally dismissing Kent for 235 second time around, Sussex lost four wickets in the mid-session and the remainder in the third day’s final session at Kent banked 20 points to Sussex’s three. The Kiwi, who spent much of the winter on the periphery of the Black Caps Test squad, had Phil Salt caught on the drive at mid-off and then went around the wicket to pluck out the off stump of left-hander Luke Wells with a full-length off-cutter – for the 200th first-class dismissal of his career. After tea, Luke Wright’s firm drive was caught ankle high in his follow through by Thomas, then Henry switched to the Pavilion End to bowl Michael Burgess through the gate as he pushed off the back foot without moving his feet. 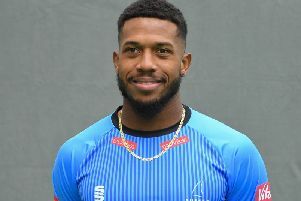 Earlier, the hosts, resuming on their overnight score of 125 for four and with an overall lead of 159, were bailed out by a counter-attacking 50 from Black Caps strike bowler Henry. Seven runs on, Ishant struck again, when Adam Rouse’s full-blooded drive flew toward gulley where Salt flung himself to his right to pull off an athletic, one-handed catch. Ishant gave way after a five-over spell of two for 15, to be replaced at the Nackington Road End by David Wiese, but Kent took their lead beyond 200 when Henry smashed a brace of boundaries off the South African’s second over.